Cheese flavored snacks, made with real cheese. Frito Lay Good Fun! Still made with all natural oil. Look for Chester Cheetah in the packaging with a flame and its mouth and squeezing a lemon at the crunchy cheetos. Learn about other Flamin Hot products by Frito Lay. I ate these from before I can remember! They're amazing!! Grew up in San Diego and moved to upstate NY 5 years ago. They do not sell them here so I am very pleased I found them on this website to order from. Now I can stop harrassing my family back home to mail me a few bags every few months. LOL Thanks Mexgrocer.com! My teenage boys LOVE this product! We found it while visiting Dallas, TX and are so glad to find that we can buy this on Mex Grocer. 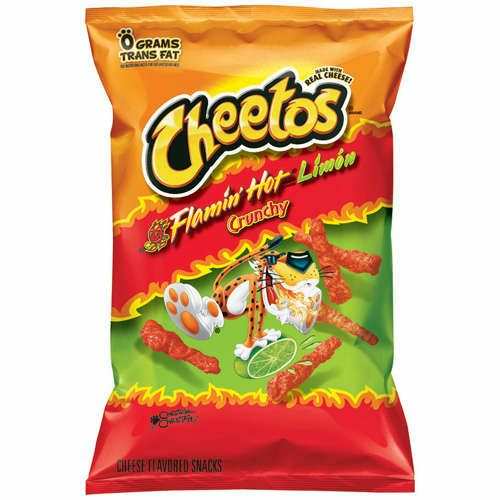 While these are good, I cannot say that the addition of lime really adds anything to what is already a fantastic product in Flamin' Hot Cheetos. I love flaming hot cheetos but now that Ive had the lime flavored flaming hot cheetos.....im addicted! Unfortunately I cant find any of them locally. These are the perfect blend of lemon and spice. I do not like hot just for the sake of hotness but these give a savory flavor that keeps you coming back until you can't stop sucking in the air and your fingers are stained!